The Zohrab Center Is Back! My name is Fr. Daniel Findikyan and on November 15, 2012 I was appointed the new Director of the Krikor and Clara Zohrab Information Center. I come to the ZIC from St. Nersess Armenian Seminary, where I was the Dean for twelve years. I remain Professor of Liturgical Studies there, helping to prepare our future priests and leaders for the Armenian Church. I am also recurring Visiting Professor of Theology at the University of Notre Dame. How would I describe myself? I am first of all a priest of the Armenian Apostolic Church and a clergyman of the Eastern Diocese (to which the Zohrab Center is attached). God and God’s magnetic pull of the Armenian people today and throughout our history intrigues me and inspires me. I am a Vartabed. My approach to reality is basically scientific (my undergraduate degree was in chemistry). But my graduate studies in music and my doctoral degree in Liturgical Studies (the history and meaning of Christian worship) draw me to the Numinous and Immeasurable. I love to plumb the depths of the oddities and marvels in the history and ways of the Armenian people. I love to challenge my students to rethink the apparently obvious and trite to discover therein astonishing things that speak to us today. There is something very Armenian about this. Read about my background, education, research interests and publications. My few days here at the ZIC have so far been filled with daily surprises. It will take quite a bit more time for me to get a handle on the treasures housed in our collection: books, periodicals, music scores, microfilms, artworks, letters, manuscripts, and historical artifacts. Last week I stumbled upon a large repository of 19th and early 20th century photographs. Strewn among staid portraits of clergymen (including one of the last Catholicos of Aghtamar) are marvelous scenes of family and village life in Ottoman Armenia. I’ll need some guidance in sorting through this trove and determining what it teaches us about ourselves and how to make those insights available to Armenians and to the public at large. I’m looking forward to making the ZIC a place where Armenians and non-Armenians will come to discover who we really are in and through the literary, theological, musical, historical and other achievements of our past, and the vibrant spirit that drives Armenian creativity today. Check back regularly for exciting opportunities to learn and connect with other inquiring minds and hearts. In due time I will be eliciting interns and others interested in assist in the ZIC’s work. 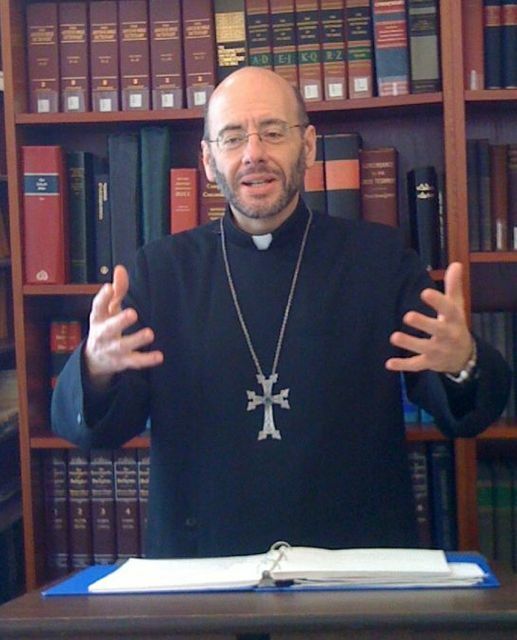 Contact me at frdaniel@armeniandiocese.org or (212) 686-0710 x126 if you have thoughts or suggestions. And stop by when you’re in the area. Great the see the Zohrab Center back on its feet! And being run by a priest from St. Nersess who says in his inaugural message that “He will need help sifting through things” (paraphrase mine). How about getting an arts or marketing professional who has run an arts or cultural organization before to run the Zohrab Center? How about raising some money? Have you see the other Cultural institutions in New York? The Scandinavian Center? The many stunning Jewish cultural centers? The French Cultural Center? That is what we should aspire to…I am sure Father Findikyan is a very smart and a nice man but isn’t it about time that we start taking our cultural institutions seriously instead of having this revolving merry go round of Executive Directors who are usually unqualified for the post(s) they hold and to boost underpaid or both? That being said, I wish the Vartabed good luck.